August West Consistently stellar wines from a partnership between winemaker Ed Kurtzman and winegrowers Gary Franscioni and Howard Graham, showcasing grapes from their Santa Lucia Highlands and Russian River Valley vineyards. 2011 saw a rainy winter followed by a cool spring and summer, with early fall rains. Yields were lower than usual from both SLH and RRV appellations. Ed says, “Despite the difficulties of the vintage, the wines turned out surprisingly well with focused fruit and age worthy structure.” The wines were released in January 2012 and are available from the winery website at www.augustwestwine.com. Feel free to call Ed directly at 415-225-2891 for questions. 14.6% alc., pH 3.59, TA 0.68, 382 cases, $45. Clones 113, 667 and Pisoni. Aged 10 months in 50% new, 44% 1-year-old and 6% 2-year-old French oak barrels. · Moderately light reddish color in the glass. Pleasing aromas of cherry pie glaze, spice and sandalwood. Middleweight array of dark red fruits, most prominently strawberries. The most elegant and redfruited of the Santa Lucia Highlands’ wines with modest tannins and a strawberry-infused finish. Not a powerhouse, buy oozes charm. Very good. 14.3% alc., pH 3.79, TA 0.60, 167 cases, $45. Clones 667, 777, 828 and 23. Aged 10 months in 71% new and 29% 1-year-old French oak barrels. · Moderately light reddish-purple color in the glass. Lovely aromas of Bing cherries and smoky oak. Mid weight flavors of cherries, raspberries and baking spices. Nicely balanced and easy to like, finishing with a kick of fresh cherries. Very good. 14.6% alc., pH 3.66, TA 0.63, 129 cases, $45. Swan selection and clone 23. Aged 10 months in 66% new, 17% 1-year-old and 17% 2-yearold French oak barrels. · Moderately dark reddish-purple color in the glass. Shy aromas of black cherry, spice and vanilla. Fairly intense and concentrated dark red berry and cherry fruit with complimentary oak in the background on the mid palate, finishing with some oak-laced, fruit-driven power and a rush of tannins. Tasted the following day from a previously opened and re-corked bottle, the aromatics still had not appeared and the wine still displayed muscular tannins. This wine should benefit from cellaring at least a year. Good. 14.5% alc., ph 3.62, TA 0.66, 406 cases, $32. From Rosella’s, Sierra Mar and Soberanes vineyards. Aged 10 months in 12% new, 59% 1- year-old and 29% 2-year-old French oak barrels. · Medium reddish-purple color in the glass. Aromatically alive with scents of purple grapes and plums with a hint of spice and brioche. Full-bodied flavors of plum and boysenberry with a hint of spice and smoky oak in the background. Juicy and vibrant with firm tannins. A solid appellation wine. Good (+). 14.1% alc., pH 3.61, TA 0.64, 215 cases, $32. Clones 667 and 777, Swan and Calera selections. Aged 11 months in 10% new, 40% 1-year-old and 29% 2-year-old French oak barrels. · Medium reddish-purple color in the glass. Aromas of cherry liquor, dark red berries, toasty oak, and tea leaf. Light, elegant and slightly savory, with flavors of cherries, cola, leaf and vanillin oak supported by mild balanced tannins. Tasted twice. Decent. Byron is located on the site of Uriel Nielson’s first commercial vineyard in Santa Barbara County planted in 1964. Over the years, Byron has found the best farming protocols, clones, rootstocks and trellising for the region and is currently undergoing an extensive replanting of the estate vineyards. Byron produces Chardonnay and Pinot Noir from estate and other notable vineyards throughout the Santa Maria Valley. Visit www.byronwines.com. 13.5% alc., pH 3.74, TA 0.50, 15, 207 cases, $29. 100% estate-owned Nielson Vineyard fruit. This wine comes from both older Pinot Noir vines planted on their own rootstock and new vines planted to high density spacing with the latest clones and rootstocks. Aged 10 months in 20% new French oak barrels. · Moderately dark reddish-purple color in the glass. Very appealing aromas of black raspberries, black plums, spice, pine and nut-scented oak. Mid weight flavors of dark berries, cherries and plums with pleasing hints of cola, spice and herbal oak. A little earthy tone fills the background. This wine is noticeably lighter, fresher and crisper in this vintage. Good. Campesino Cellars Griselda Montoya grew up in the Carneros region of Napa and spent her childhood at Papi y Chula Vineyard which is owned and farmed by the Ceja family. Her brothers and their spouses founded Ceja Vineyards and together with Macario Montoya, she started Campensino Cellars. 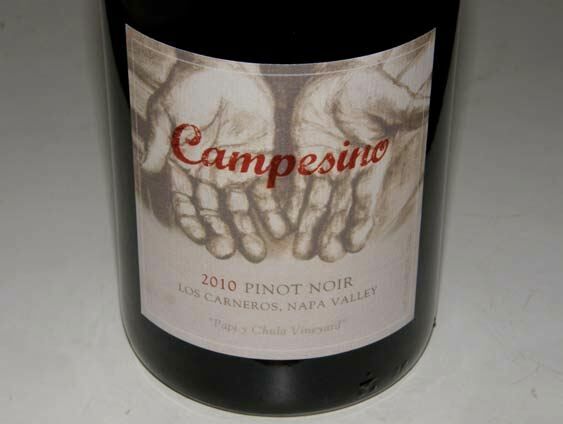 Campensino translates in English as “fieldworker.” The Campesino Cellars wines are a homage to all campesinos. “A mis carnales y mis carnala gracias por su trabajo”: “To my brothers and sisters thank you for your work.” The Papi y Chula Vineyard is farmed by Griselda’s brother, Armando Ceja. Located about a mile north of San Pablo Bay, this 5- acre vineyard is exposed to cooling winds during the day and fog at night. The vineyard’s shallow clay-loam soil produces a low vigor vine, resulting in low yields. Visit www.campesinocellars.com. 14.2% alc., pH 3.68, TA 0.65, 56 cases, $38. Aged 18 months in 100% second fill French oak barrels. · Medium reddish-purple hue in the glass. Enticing aromas of cherries, oak, hazelnut, chocolate and rose petals. Very flavorful mid weight core of cherries, brambly raspberries and black plum with an earthy and subtle oak undertone. Easy to drink with supple tannins, and a refreshingly crisp and teasing finish. Gets better over time in the glass and even better the following day from a previously opened and re-corked bottle. Very good. Paraiso Vineyards consists of over 3,000 acres of grapes farmed by the innovative Smith family who have perfected mechanical harvesting, mobile vineyard pressing, and advanced trellising and irrigation systems for the region. They helped outline and establish the Santa Lucia Highlands Viticultural Area. The winemaker is son-in-law David Fleming, making this a true family wine estate. Paraiso offers a Santa Lucia Highlands Pinot Noir, a “West Terrace” Santa Lucia Highlands Pinot Noir, individual clonal bottlings under the Faite label, and a Faite top-of-the-line Santa Lucia Highlands Pinot Noir. Visit www.paraisovineyards.com. 14.2% alc., 14,672 cases, $25, screwcap. Double Gold Medal at San Francisco Chronicle Wine Competition. Third generation growing family with first vines planted in 1973. First winery in region to receive SIP™ Certified Sustainable in 2008. A blend of six clones from estate vineyard. 70% fermented in 5-ton open top fermenters with the balance in 10-ton tanks. Aged 11 months in French oak barrels. · Moderately light reddishpurple color in the glass. Scent of cherries, raspberries, brown spice and maple syrup. Tasteful in an elegant style, featuring cherry and strawberry flavors with a hint of baking spices and oak. Juicy, with soft tannins. A satisfying drink that was even better the following day from a previously opened and re-corked bottle. Very good, especially at this modest price. ROAR is a partnership between Gary and Rosella Franscioni, owners of the Garys’ (with Gary Pisoni) and Rosella’s vineyards. The name “ROAR” is derived from the sound of the ocean winds that are characteristic in the Santa Lucia Highlands winegrowing region. In 2007 and 2008, Gary planted Sierra Mar Vineyard, located six miles south of Garys’ Vineyard and the Soberanes Vineyard, just south of Garys’ Vineyard which he is developing in partnership with the Pisoni family. Roar was launched in 2001 with the goal of producing small lots of Chardonnay, Pinot Noir and Syrah from Rosella’s, Sierra Mar, Soberanes, Garys’ and Pisoni vineyards. The winemaker is Ed Kurtzman. The two wines reviewed below are already sold out at the winery. The next release of 2011 ROAR wines will be July 2013. Join the mailing list at www.roarwines.com. 14.9% alc., pH 3.73, TA 0.54, 1,158 cases, $40. Pisoni, Swan and Pommard clones harvested at 26.5º Brix. Aged 11 months in 46% new and 54% 1-year-old French oak barrels. Unfined and unfiltered. · Moderate reddish-purple color in the glass. Nicely perfumed with bright aromas of dark berry jam, plum pudding and fresh brioche. Tasty essence of dark stone and berry fruits with good concentration and a reasonably full, satiny finish. A solid, impressive appellation wine. Very good. 14.9% alc., pH 3.62, TA 0.58, 641 cases, $52. Pisoni clone harvested at 26.8º Brix.. Aged 11 months in 77% new and 23% 1-year-old French oak barrels. Unfined and unfiltered. · Moderate reddish-purple color in the glass. Welcoming aromas of red and black berry cobbler, black cherries and clove. Delicious core of dark red fruits with a slight savory accent. Full-bodied with a seductively soft texture and very fine tannins. Beautiful integration of oak. A little big and high in alcohol for me personally, but this is a great wine in its style. Garys’ Vineyard seemed to perform beautifully in this vintage. 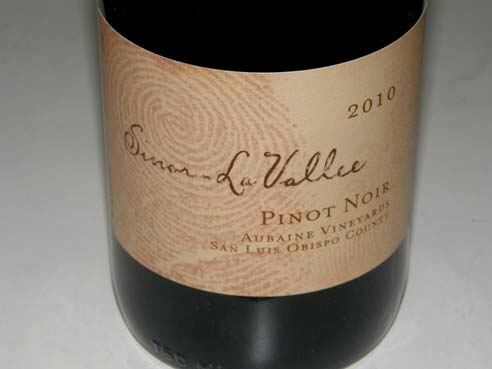 Sinor-LaVallee was founded by the husband and wife team of winemaker Mike Sinor and Cheri LaVallee Sinor in Arroyo Grande in 1997. Mike started his career at Corbett Canyon Winery and then became assistant winemaker under noted Central Coast vintner Ken Brown at Byron. He left after the 2000 harvest to become winemaker at Domaine Alfred Winery in San Luis Obispo at the site of Chamisal Vineyard. It was here that he met his stride and received considerable notoriety, directing vineyard operations, instituting biodynamic farming, and crafting wines that brought the winery considerable national acclaim, particular for Pinot Noir. In 2006, Mike left Domaine Alfred (now Chamisal Vineyards) to focus on Ancient Peak Winery and the Sinor- LaVallee label. 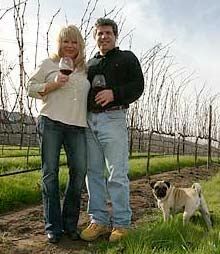 Mike is one of the founding members of the World of Pinot Noir and has often served on the board of that event. He crafts small lots of Pinot Noir and Syrah under the Sinor-LaVallee label from vineyards that are within a bicycle ride from his home in Arroyo Grande. The label features Mike’s thumbprint on the left and Cheri’s on the right with the kids’ thumbprints on the back label. Visit www.sinorlavallee.com. 14.5% alc., 135 cases, $30. A blend of fruit from Talley-Rincon Vineyard in Arroyo Grande and Squire Canyon Vineyard in Avila Beach. Average yields 2.8 tons per acre. 25% whole cluster. Native and natural fermentation, pressed off with a basket press. Aged 12 months in 50% new Francois Frères French oak barrels. Unfined and unfiltered. · Moderately dark reddish-purple color in the glass. The aromas have not arrived in this wine yet, but with swirling, delicate scents of very ripe stone and berry fruit emerge with a pleasant oak backing. The mid palate attack of strawberry, raspberry and plum fruit flavors are moderately intense. The tannins are well managed and the wine finishes with modest but pleasing length. Good. 14.5% alc., 93 cases, $40. Seventh vintage from this block. Yield 2.23 tons from one acre. 100% de-stemmed. Inoculated and native fermentation. Aged 17 months in 50% new Francois Frères French oak barrels. Unfiltered. · Moderately dark reddish-purple color in the glass. Aromas of black cherries, black plum sauce, flint stone and forest floor. A savory wine with layers of intense flavor and finishing power, featuring ripe dark red and purple fruits. Very open and inviting with good structural bones and a bold demeanor. Very good. 14.5% alc., 143 cases, $40. This 12-acre vineyard is south of Laetitia Winery on the eastern side of Highway 101. Primarily 667 with a small amount of 777. 33% whole cluster. 50/50 inoculated and native fermentation. Aged 17 months in 50% new Francois Frères French oak barrels. Unfiltered. · Dark purple color in the glass. Scent of loganberry jam, raw beef, and roasted plum. Deep plum flavor with a subtle sidecar of spice, dark chocolate and citrus. Very seductive velvety mouth feel with a robust, long, long finish. Beautiful integration of oak. This wine can be a ball buster, but it is a chiseled ballerina in this vintage that is oozing charm. Always a terroir-driven wine of distinction. Waterstone Winery is a collaboration between winemaker Phillip Zorn and longtime wine executive Brent Shortridge. The two men founded the label in 2000 in Napa Valley to produce luxury wines at affordable prices. Zorn has winemaking experience at Sunny St. Helena, Gauer Estate, Paraiso Springs and Tria. The portfolio includes Cabernet Sauvignon, Merlot, Pinot Noir and Sauvignon Blanc. The wines are available for tasting at the Taste at Oxbow in downtown Napa. Visit www.waterstonewines.com. 14.4% alc., pH 3.63, TA 0.59, 1,241 cases, $22. A blend of several clones from mature vines. 100% de-stemmed, whole berry fermented in open top fermenters, aged 14 months in 35% new and 65% used French oak barrels. Gently fined and filtered. Winemaker Philip Zorn. · Moderately light reddish-purple color in the glass. Appealing array of aromas quite accessible upon opening including dusty plum, cherry and strawberry with a hint of rhubarb. Light and elegant in style, featuring dark red and purple fruits graced by gentle tannins and accented with a spicy tone. An easy drinking, food-friendly wine. Good. 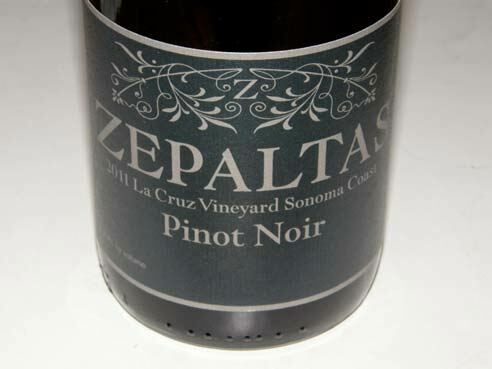 Zepaltas Wines is the eponymous label of Ryan Zepaltas, a young winemaker who assists at Siduri Wines and started his own label with the 2005 vintage. He originally planned a career in skateboarding and moved to Sebastopol to live with relatives and explore opportunities in the San Francisco Bay area. He soon made friends with people in the wine industry including Mike Mendenhall, who was the cellar master at the time at La Crema and he offered him a job. Ryan gradually took to winemaking and went to New Zealand to work a harvest. Upon returning to California he found a harvest position at Siduri and has been there ever since. Most recently he has been crafting the wines for Soliste as well. For more information and to order wines, visit www.zepaltaswines.com. The 2011 wines will appeal to fans of lower alcohol, elegantly-styled Pinot Noir. 13.2% alc., pH 3.59, TA 0.60, 219 cases, $31. A blend of fruit from four vineyards. Aged 14 months in 33% new French oak barrels. · Moderately light reddish-purple color in the glass. Aromas of cherries, red berries, and spice with a slight pungent note. Light and delicate with soft tannins, featuring cherry, red raspberry and strawberry flavors with a flowery note in the background. Decent. 13.8% alc., pH 3.65, TA 0.60, 48 cases, $42. Clones 777 and 115. Aged 14 months in 40% new French oak barrels. Unfined and unfiltered. · Moderate reddish-purple color in the glass. A melange of aromas including dusty dark cherries, blueberries, rose petal, cocoa and a hint of straw. An elegant, easy drinking wine with the tasty essence of fresh cherries with a touch of spice and oak. Light in weight, with gossamer tannins, and a kiss of cherry on the finish. Good. 13.5% alc., pH 3.60, TA 0.60, 98 cases, $42. Seventh vintage from this vineyard. 115, Pommard and 114 clones. Aged 14 months in 33% new French oak barrels. Unfined and unfiltered. · Light reddish-purple color in the glass. The nose is expressive, offering aromas of dark berries, plum, cooked cherries and a hint of fecundity. Light in weight with an elegant demeanor, offering flavors of red raspberries and strawberries with a pleasing savory riff. A charming wine with a delicate finish. Good (+).